Have you ever had problems bundling your pruned thorny bushes for disposal? I have. Handling these thorny plant stems and branches can be a real pain when they're not bundled properly. Worse, there have been instances when garbage collectors become hesitant to take your "green" garbage made of thorns. I've heard a garbage guy grumble more than once upon seeing the familiar spiky branches. Bougainvillea is notorious for thorns. It can grow very tall and will almost always require some pruning. In our case, it's the Rose Cactus or Pereskia bleo. This plant can grow into a very big bush as shown below. 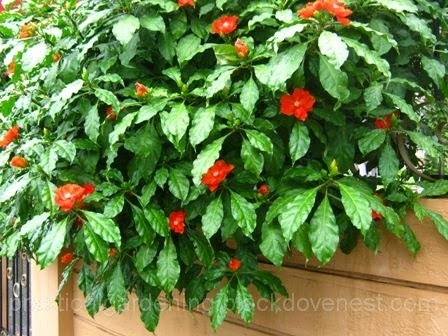 It has very beautiful bright orange flowers that bloom year-round. What lies underneath all that beauty though are needle-like thorns on the stems. Needless, to say, when these branches are pruned and bagged for throwing, they've caused much grief for the trash collectors as they fall victims to the thorns. Of course I'd rather have them haul the bundle of thorny stems and branches without any problems. So here's a simple tip for you to safely cut and then put away those pruned thorny stems and branches so they don't cause much injuries. This is biodegradable trash, so keep it at that. No need cover it up with plastic sheets or have a plastic receptacle for it. This is trash (albeit green trash) for you and you don't need to "pre-process" trash to get rid of it. You don't need to clip or cut the thorns. You want it out of your house as quickly as you can. Old newspapers - You may also use old brown paper bags or a sheet of cardboard or carton as that from an old cake box. The sharper the thorns, the thicker the newspaper sheets or cardboard. Thin plastic straw or yarn - You may use some biodegradable material in its place to keep it completely "green". Pruning Shears - They come in different shapes and sizes. Choose one that can do the job for thick branches. Safety Goggles - Any protective eye wear will do. Heavy Duty Gloves - Needle-like thorns are likely to pierce through many gloves. Some protection is better than no protection at all. Hold a bamboo stick with your left hand and part away the branches that get in the way. This does two things. It clears up space for you to reach inside the plant and prevents the thorny branches from scratching you unnecessarily. With the branches set aside by the bamboo stick, reach inside with the right hand holding the pruning shears. Ensure you don't let go of the stick that's holding the branches aside. The branches may spring back with force that may likely injure you. Carefully cut the branch. Note the needle-like thorns on the branch. These thorns could penetrate most garden gloves. Cut purposefully and decisively. This allows you to finish the cut and pull out your right hand as quickly as possible. Use the pruning shears to pick up the cut branches as shown. This will allow you to move and pile the cut branches without having to hold them.